Putting aside nutrition for the moment, let’s break this news down a little bit. First, Bloomberg claims that Dunkin’ Donuts will win the race with fast food competitors, Starbucks and McDonalds to offer gluten-free items. Um………. didn’t Starbucks offer gluten-free baked goods and few years ago and then stop selling them? Yes, yes they did. Way to do your research Bloomberg. Second, haven’t we all seen how “gluten-free” doesn’t always mean “free of gluten?” For example, Dominos rocked the fast food world with their offering of gluten-free pizza in 2012. Celiacs and the Dominos legal team quickly discovered that the pizza often had traces of gluten due to the shared kitchen facilities. Dominos now states their GF pizza isn’t safe for Celiacs. While it’s great news that Dunkin’ Donuts will offer GF items, we need to know more about how cross-contamination will be handed. This new venture by Dunkin’ Donuts is a great way to increase visibility for gluten issues. As a community, we need to push them for transparency in their practices and high standards in ensuring a gluten-free preparation line. Who wins in your internal debate? Angel telling you to steer clear of sweet treats or that little devil driving you to temptation? This entry was posted in Prepared foods, USA and tagged Dunkin' Donuts on June 20, 2013 by gfvermont. 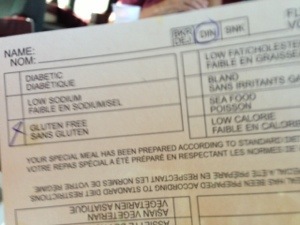 Traveling in Canada, gluten free! sensitive and caring about gluten issues, including Celiac. to 15% of North Americans have some degree of gluten allergy. Late tomorrow we leave Toronto on the VIA Rail train to Vancouver, BC. I’ll let you know how it goes as we get further from Vermont. This entry was posted in Prepared foods, Travel and tagged special meals, Via rail on June 18, 2013 by gfvermont. How much is “just a little” when it comes to gluten exposure? My mother has been “glutenated” a few times recently. She’s learning that she’s more sensitive to gluten than when she first went GF. For example, I’ve seen her eat regular soy sauce several times, whereas I *must* have GF soy sauce. 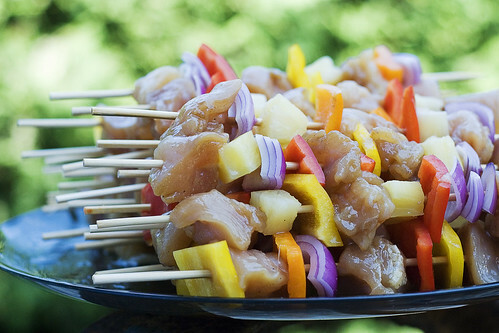 A few weeks ago she picked up prepared chicken kabobs at the grocery store and thinks they made her sick. I asked if they had soy sauce and she said she didn’t really pay attention because the ones at the other grocery store were always fine. Then about a week ago she got sick after chinese food that may have had soy sauce in it– she thought it didn’t but hadn’t bothered to ask since it had never affected her before. I told my mother that REPEATED exposure can make each reaction worse. The chicken kabobs taxed her system and then repeating the exposure just a week or so later made for another bad reaction. Had these events been spaced weeks or months apart it is possible the second one wouldn’t have been so bad. This entry was posted in Grocery Stores, health, News, Prepared foods and tagged exposure, sensitivity, sick, soy sauce on May 25, 2013 by gfvermont. I’ve never tried a prepared meal service before but I could see their usefulness… for an out of town guest, for a hectic week in your life, for times where you want a good meal but just can’t cook it yourself. Living Social is offering a discount this week for prepared meals for a week from Beatnik. Check it out! This entry was posted in Prepared foods and tagged food, meal service, prepared meals on May 24, 2013 by gfvermont. Trader Joe’s… coming soon to a location near(er) to you!!! This just in… Trader Joe’s moving into South Burlington! Since I moved to VT in fall of 2012 I’ve heard plenty of moans about “if only there were a Trader Joe’s!” Friends driving to NJ stop in Albany to stock-up. Likewise with Boston journeys. Well, the stockpiling of cheap almond butter and goat cheese will end sometime next year. The South Burlington Review Board just approved the development. It now has to go through city council where it is favored to pass. IT would have a prime location on Dorset St. The owners of next-door Healthy Living welcome the addition, saying that it will bring more people into the area. I look forward to being able to walk between the two! This entry was posted in Burlington, News, Prepared foods and tagged trader joes on April 30, 2013 by gfvermont.